Finding Signs of Water and Conditions for Life! This high-resolution image captured by the Mars Exploration Rover Opportunity's panoramic camera highlights the puzzling rock outcropping that scientists are eagerly planning to investigate. Score! Near the rim of Endeavor Crater, Opportunity found bright-colored veins of gypsum in the rocks. These rocks likely formed when water flowed through underground fractures in the rocks, leaving calcium behind. A slam-dunk sign that Mars was once more hospitable to life than it is today! Opportunity is a crater explorer. 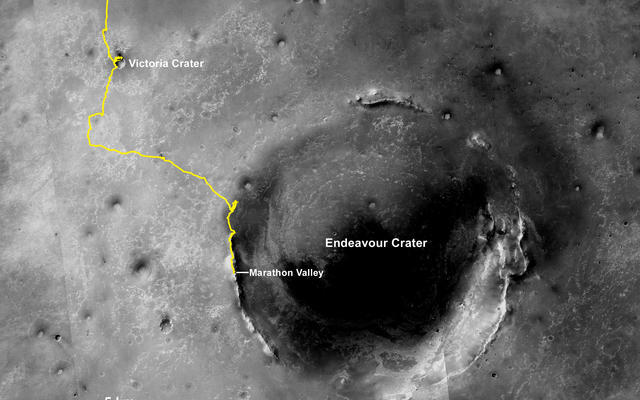 The rover has visited and studied the geology well over 100 impact craters of all sizes in its 14 years on Mars. It has learned about the lives of craters: how they form and erode through time. 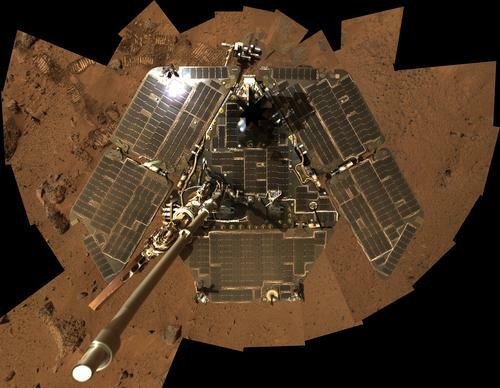 Opportunity has been continually monitoring Mars for more than 14 years! It has collected a wealth of scientific riches on the Martian environment by studying Mars' clouds and dust, the opacity (tau) of its atmosphere, and how it affects the solar panels (solar energy). This type of information will help inform future Mars missions. From the tiniest bacterium to the largest tree, all life as we know it requires water. Though we don't yet know if life ever existed on Mars, within weeks of arriving, NASA's Mars Exploration Rover Opportunity discovered that the plains of Meridiani were once a water-soaked place. Rover scientists found signs of water in the first rocks they encountered on Mars. This outcrop, nicknamed "El Capitan," exhibited physical features and minerals pointing to a watery past. While analyzing rocks and soils on Mars, the robotic geologist, equipped with a toolbox of scientific instruments, found hard spheres the size of peppercorns. Sometimes the spheres, nicknamed blueberries," were loosely scattered across the surface; other times, they were anchored within individual rock layers. After weeks of meticulous measurements, Opportunity demonstrated that the spheres consisted primarily of the mineral hematite. On Earth, hematite generally -- though not always -- forms in the presence of water. Water provides the oxygen atoms that bind with iron atoms in the mineral. 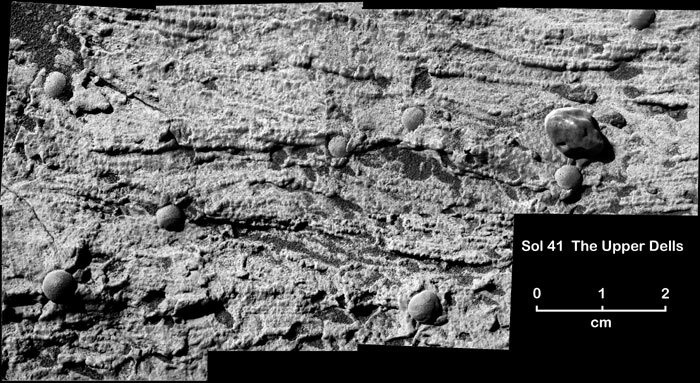 On Mars, it appeared possible that groundwater carrying dissolved iron had percolated through the sandstone to form the tiny spheres. Rocks near the Opportunity rover's landing site, such as those in this false-color image, contained pearl-shaped rocks that formed in pre-existing wet sediments, as well as finely layered ripples, crossbeds, and niches where crystals once grew and were later redissolved. 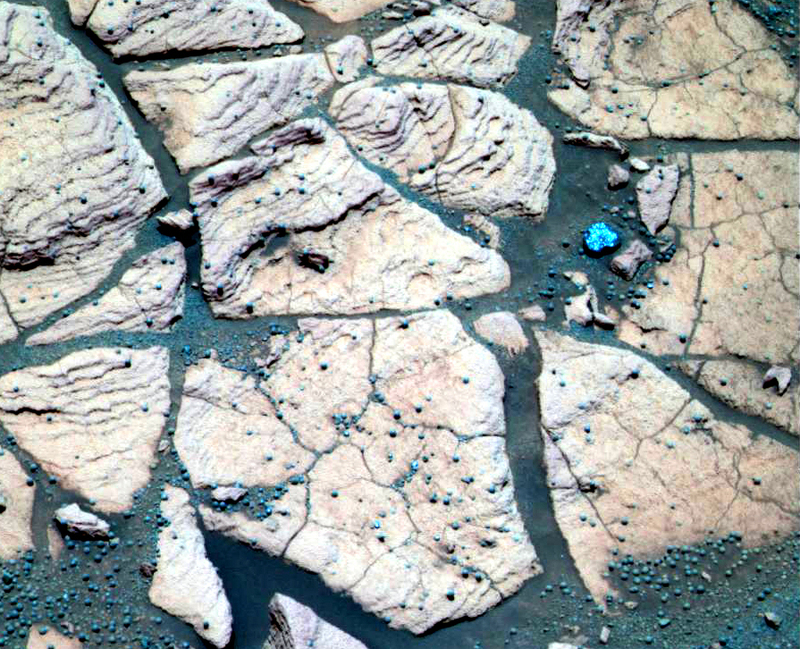 When Opportunity later discovered the mineral jarosite, scientists were ecstatic. Jarosite only forms in the presence of acidic water, so this mineral provides clues to what the environment was like when water was around. Acidic water is harsh, but we know that microbes on Earth can thrive in it. 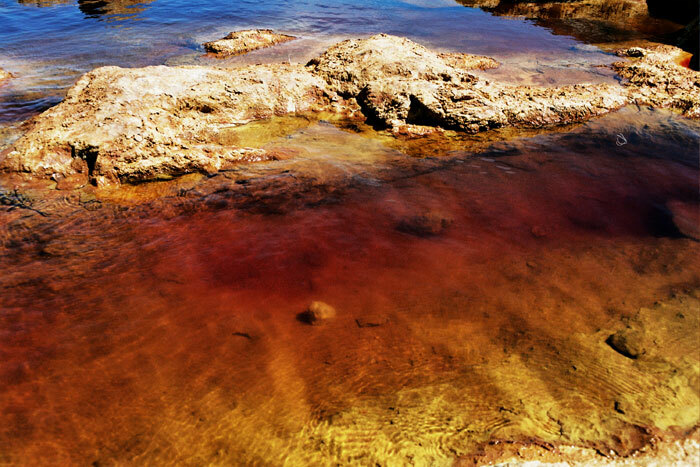 On Earth, microbial communities thrive in highly acidic waters rich in iron and sulfur, such as the blood-red waters of the Rio Tinto in southwestern Spain. Among the minerals dissolved in the Rio Tinto is jarosite, an iron- and sulfur-bearing mineral also found on Mars. Whether life ever existed on Mars has yet to be deteremined. 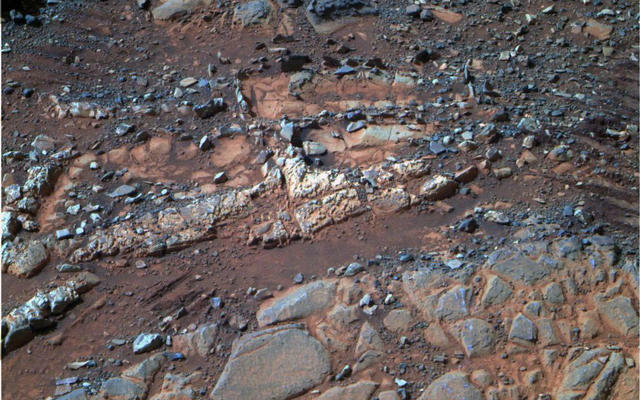 Perhaps most stunning of all was Opportunity's discovery of centimeter-scale rock layers overlapping and cutting into each other. Known as crossbeds, these layers had shapes and sizes that indicated that water once flowed on the surface of Mars. In nearby "Endurance Crater," a thick stack of exposed rock layers, some deposited by wind, suggested that water was intermittently present. Rich in the elements sulfur, chlorine, and bromine, many of the minerals studied by Opportunity had settled to the bottom of a salty body of water, known as a brine, to form deposits similar to those seen in salt flats in desert regions on Earth. One characteristic of rocks formed by flowing water are fine, undulating layers of sediment, like those at the bottom of a stream, that flow over and cut into one another, known as crossbeds. 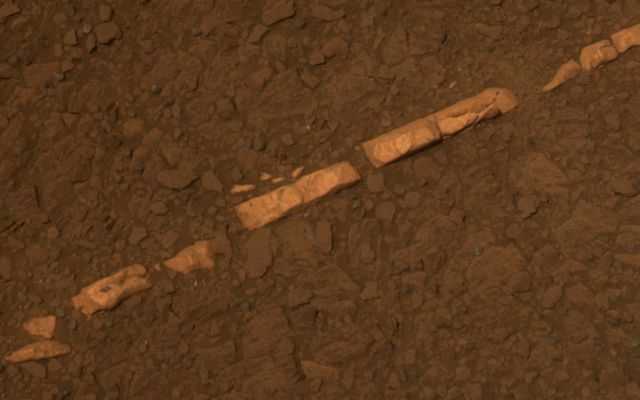 On Mars, wind and water eroded the rocks containing these minerals and carried pieces of them to their current location. These grains piled up with bits of volcanic rock and solidified to form sandstone. Many such layers, stacked atop one another and containing minerals that had initially settled as water evaporated, indicated that water was present for a long, long time. 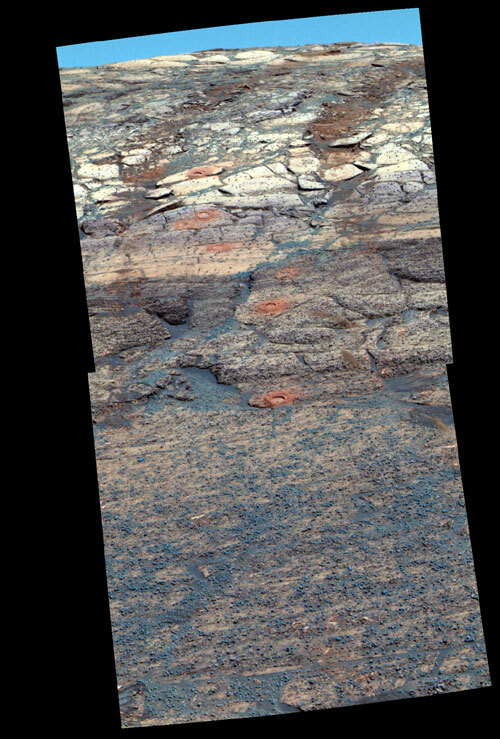 Opportunity discovered tiny cavities in the rock that were similar in shape and size to rock cavities on Earth that are left behind when certain minerals are dissolved and dispersed by groundwater. A rock wall 10 meters (33 feet) high, known to rover science team members as "Burns Cliff," in honor of a geologist who predicted that jarosite would be discovered on Mars, contained many layers of rock, some deposited by water and some by wind. Understanding how water contributed to the environment on Mars is the first step in determining whether the red planet could ever have supported life. Evidence of water also points the way to promising sites for investigation by future missions. 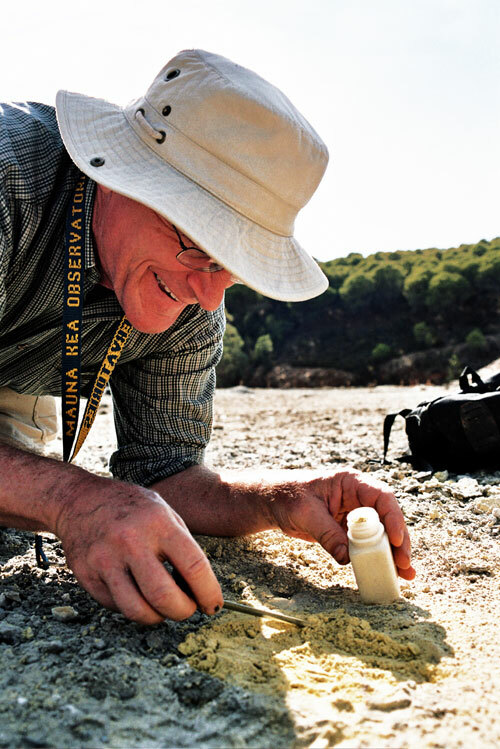 Planetary scientist and chemist Richard Morris, of NASA's Johnson Space Center, collects a soil sample in the Rio Tinto area of Spain. The soil contains jarosite, a water-bearing mineral rich in iron and sulfur that was found on Mars by NASA's Opportunity rover. Today, liquid water is not found on the surface of Mars because the planet is too cold and the atmospheric pressure too low. Yet, not only the Mars rovers, but earlier missions such as NASA's Mars Global Surveyor orbiter and the Pathfinder lander and Sojourner rover, found evidence suggesting that Mars was once a wetter place. Some scientists think Mars used to be warmer. Others think Mars has always been a cold place by Earth standards, but that frozen water melts periodically when the planet's poles are tilted more directly toward the Sun. Some think volcanic activity may occasionally melt polar ice or ice buried beneath the surface. Modern Mars is a vast desert of sand dunes, ripples, dust devils, and streaks of materials deposited by wind. Dust even covers icy deposits at the poles. But the surface of the Red Planet has been wet at times. Both Mars rovers as well as orbiters have found plenty of evidence for water in the past. 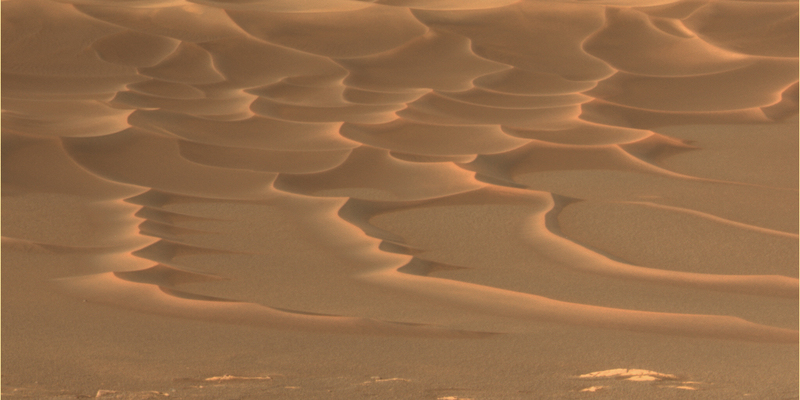 Opportunity used the 13-filter panoramic camera to acquire this color image of dunes marching across the floor of Endurance Crater. If life could ever have existed on the surface of Mars, it would have had to be able to survive the planet's climate. Both Mars Exploration Rovers have collected a treasure trove of data about the Martian atmosphere to help characterize the modern climate on the red planet. This information is important because atmospheric conditions affect the amount of sunlight reaching the surface and the amount of heat reflected back into space. 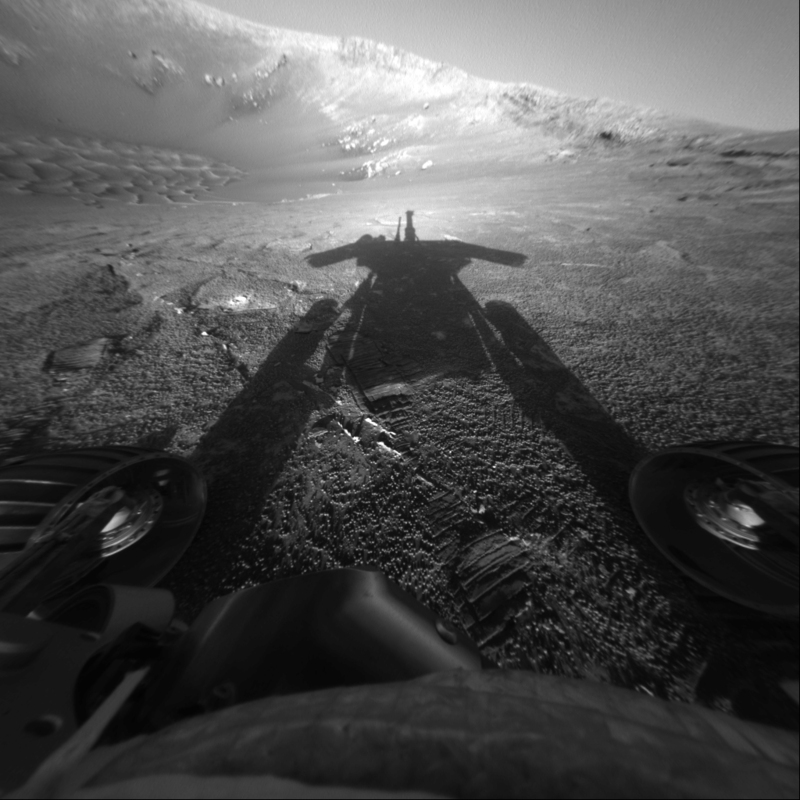 In October 2004, the Opportunity rover documented a thin veneer of frost coating a black peg that serves as a calibration target for the panoramic camera. Spirit and Opportunity surveyed the amount and distribution of dust and water ice in the Martian atmosphere, using cameras and spectrometers that measured the absorption of different wavelengths of light. As the seasons changed from summer to fall to winter to spring, the rovers monitored changes in temperature at different heights above the surface and at different times of day. In November, 2004, Opportunity observed clouds at the onset of Martian winter. Similar in appearance to cirrus clouds on Earth, these clouds are believed to be composed of water-ice particles on the order of several micrometers (a few ten-thousandths of an inch) in length. The rovers have provided daily weather reports from Mars. Spirit documented dozens of daily dust devils during the Martian spring. 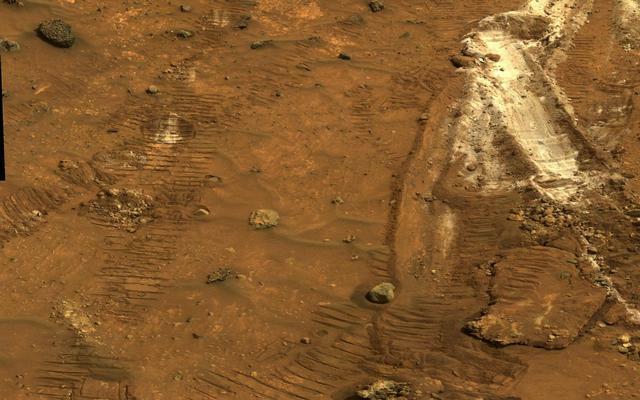 On the opposite side of Mars, Opportunity took images of clouds in the Martian sky and frost on the rover deck. These observations are giving researchers a better understanding of current climate conditions on Mars, an important step in determining how they may or may not be different from those in the past. During spring and summer of 2005 on Earth, Spirit often observed dozens of dust devils each day at around lunchtime local solar time on Mars. 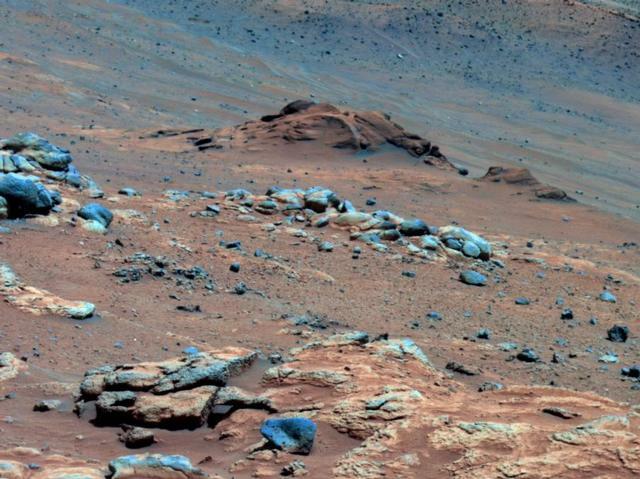 As on Earth, rocks and minerals on Mars contain clues to the past. Scientific investigations by Spirit and Opportunity tell a story of a sulfate-rich planet that was once wetter and prone to violent explosions from meteorite impacts and volcanoes. At various times, winds blew sand across the surface and water flowed on the surface and soaked the ground. Some of the conditions necessary to sustain life as we know it were present. Whether life ever existed on Mars remains an open question. 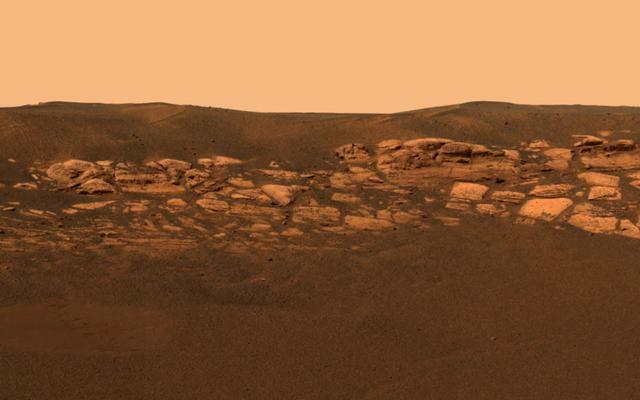 In this panorama, one of many acquired by the Spirit rover since arriving at Mars in 2004, are slopes and summits of the "Columbia Hills," ripples and rover tracks in the sand, black rocks hardened from lava, the floor and distant rim of Gusev Crater, suspended dust in the atmosphere, and other features of Martian geology seen from the top of "Husband Hill." Both rovers measured the type and abundance of iron-bearing minerals, some of which are associated with water-driven processes. In this way, Opportunity found the mineral jarosite and Spirit found the mineral goethite. The rovers measured chemical elements, some of which are needed for life, in rocks and soils. They ground holes in weathered rocks, looked beneath the weathered surfaces, and acquired magnified views of textures and soil grains. The Spirit rover used a suite of scientific instruments to determine that this rock target, called "Clovis," contained goethite, a mineral that only forms in the presence of water. Spirit also found elevated levels of sulfur, bromine, and chlorine deposited by evaporating water. Measuring infrared radiation (heat) associated with specific minerals, the rovers identified and mapped minerals in rocks and soils. Key among these was hematite, an iron-bearing mineral often associated with water originally mapped by the Odyssey spacecraft. 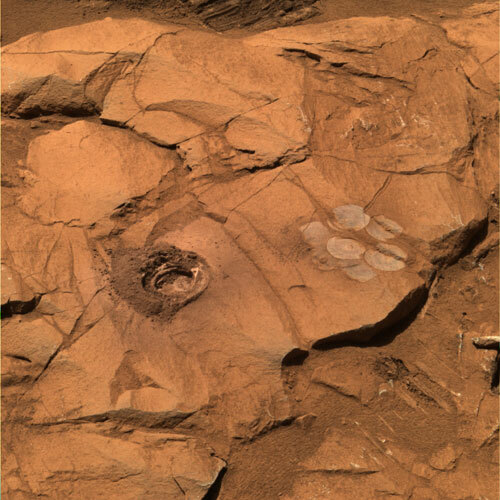 After being sent to the same area to get a closer look, Opportunity did indeed find hematite in rock outcrops as well as in high concentrations in the rounded, blueberry-size concretions. 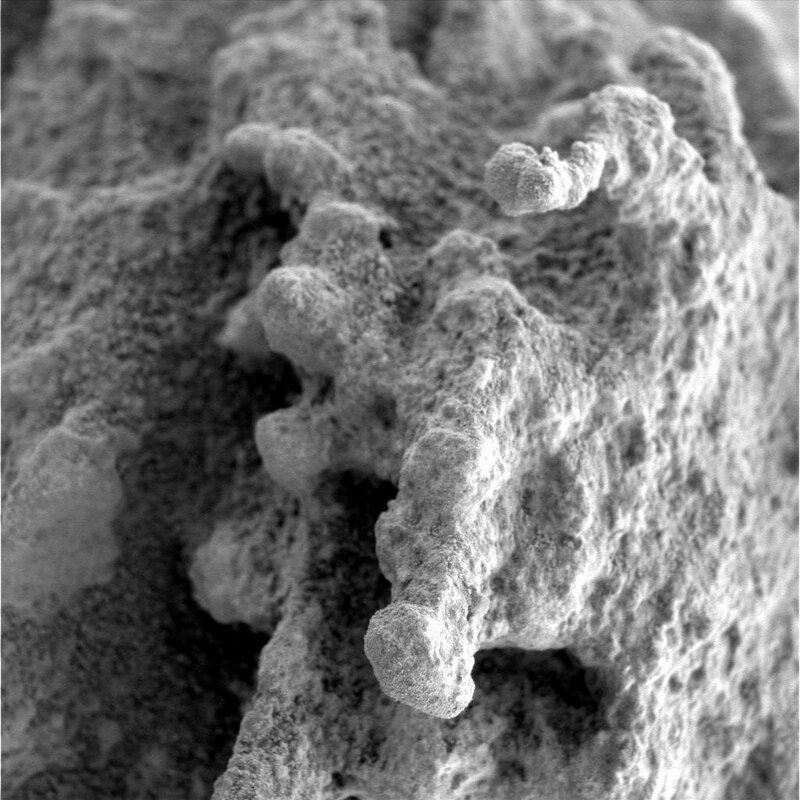 Nodular nuggets at the end of short, stalklike features were one of the more unusual features of a softball-size rock nicknamed "Pot of Gold" by rover scientists. Spirit's scientific instruments determined that the rock contained hematite, a mineral often formed in the presence of water. Each day, the rovers sent images to Earth that include spectacular panoramas of an alien landscape as well as information about color variations (measured by camera filters) in rocks, soils, and sunlight. Like polarized sunglasses that minimize glare yet enhance features in the landscape, these color images have helped scientists map the composition of landforms, geologic structures, rock shapes, and textures. Scientists and students will spend many years analyzing all the data collected by the rovers and investigating the ways in which Mars is similar to yet different from Earth. Like trail markers for hikers, a series of holes rimmed by red Martian dust marks Opportunity's journey of exploration into the interior of Endurance Crater in this false-color image. The rover's panoramic camera has 13 different color filters. By enhancing the wavelengths seen in different images, scientists can better highlight changing features in the rocks. By demonstrating that it is possible to land safely and operate sophisticated equipment on Mars -- equipment that can last for years -- Spirit and Opportunity have helped blaze a trail for human exploration. More than three years into a mission that was originally planned to last 90 days, they have successfully wheeled their way over sand drifts and rocks, crater walls, and hills. Both rovers have survived a complete change of seasons on Mars while keeping a detailed log of changes in temperature, solar radiation, and atmospheric dust. Information they have collected about minerals and grain sizes in dust and soil will be vital to the design of spacesuits and vehicles carrying human explorers. 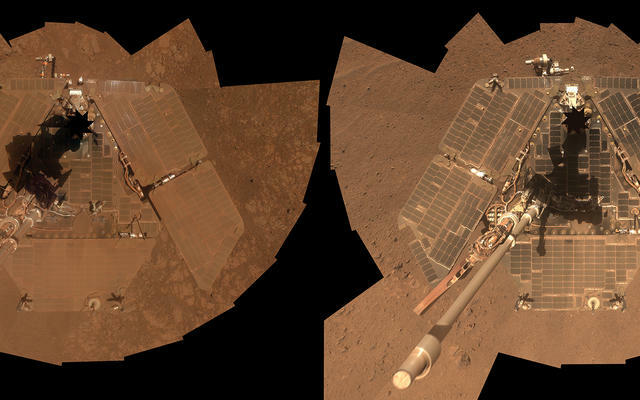 Spirit's solar panels were still gleaming two years after landing on Mars in this approximate true-color image taken in January 2006. In overcoming unexpected obstacles, Spirit and Opportunity have demonstrated that it is possible to design and deliver robots to other planets that can move independently about the surface and adapt to changing conditions in harsh environments. 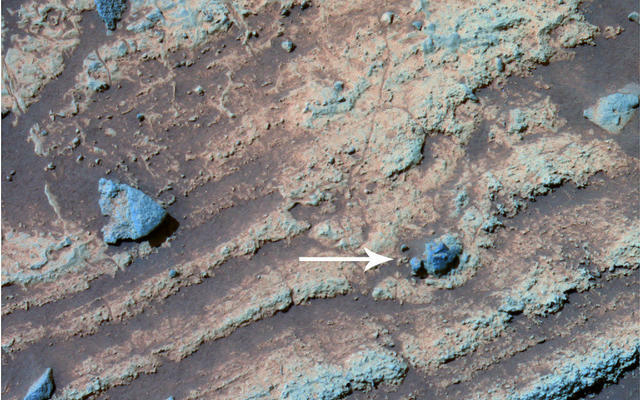 While exploring Mars, rover drivers guided Opportunity out of a sand trap and wiggled a trapped rock loose from one of Spirit's wheels. Engineers learned to drive Spirit alternately forward and backward to redistribute lubricant in the wheel motor of a stuck wheel. They learned to operate Opportunity's robotic arm without one of the shoulder motors. Future spacecraft designers will apply lessons learned by the Mars rovers about soil characteristics, wheel sinkage, temperature changes, lubricant behavior at extremely cold temperatures, solar energy, wind-blown dust, and other conditions to design new, even more capable vehicles for exploring Mars. Scientific instruments on the end of both rovers' robotic arms have collected a treasure trove of data about the minerals and chemical composition of dust, soils, and rocks on Mars. 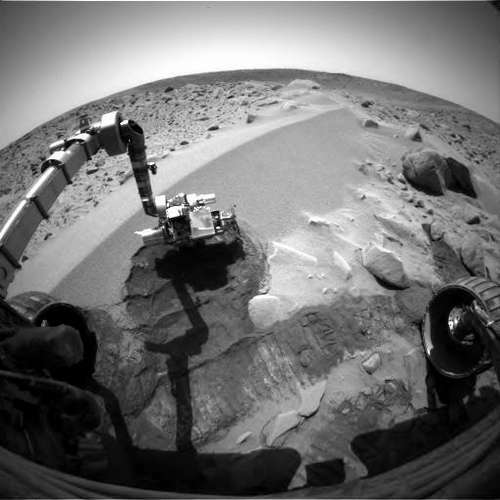 Here, Spirit gathers data from a sand drift nicknamed "Serpent." Spirit took this image with the left front hazard avoidance camera in March 2004. Thanks in part to the Mars Exploration Rovers' success, human footprints may one day accompany the wheel tracks in the Martian sand. A pilgrim crossing into a new frontier, Spirit acquired this color panorama in November 2004, en route to the top of "Husband Hill," as residents of the U.S. were celebrating Thanksgiving.